Christine Blasey Ford has closed donations on her crowdfunding page and is hoping that things will go back to normal for her and her family two months after she testified at Brett Kavanaugh's Supreme Court confirmation hearing that he sexually assaulted her when they were in high school. Ford's neighbors in Palo Alto, California, say they still haven't seen the psychologist and professor at Palo Alto University since before the extraordinary Senate hearing in September. 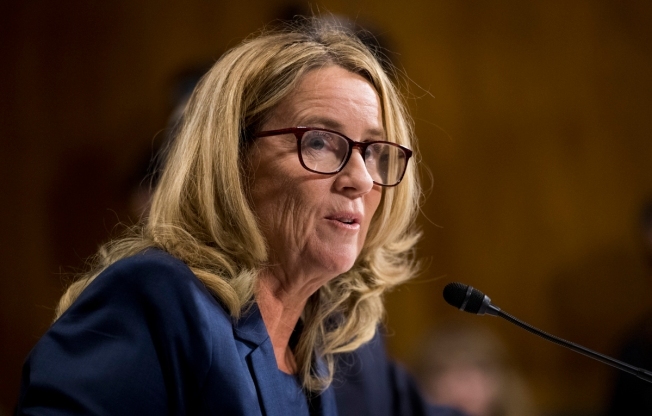 Threats forced Ford from her home, but she said last week in an update on the GoFundMe page set up for her that the crowdfunded donations were a "godsend" that helped her and her family cope. The GoFundMe page raised about $650,000 from nearly 14,000 people over two months. Ford said the money has been used to pay for security to deal with the "frightening threats" she received since reluctantly coming forward with her allegation. She added that she'll donate whatever is leftover to trauma survivor support groups. "Your tremendous outpouring of support and kind letters have made it possible for us to cope with the immeasurable stress, particularly the disruption to our safety and privacy," Ford said in an update posted the day before Thanksgiving. The hearing pitched Ford's word against Kavanaugh's and nearly prevented his confirmation to the Supreme Court. But Kavanaugh forcefully denied that he ever sexually assaulted Ford or anyone else and he was narrowly confirmed to the Supreme Court in a vote that polarized the country. Ford told the Senate in September that she'd always lived in fear of what would happen if she spoke out against Kavanaugh, who was a White House lawyer before becoming a federal judge. Coming forward brought out "constant harassment and death threats" that was worse than what she'd expected and left her terrified, she said. She also said in the GoFundMe update last week that the donations went toward a new home security system, housing costs while she and her family have been displaced and a security service that is beginning to taper off. The support has left her hopeful that "our lives will return to normal," she wrote. "Although coming forward was terrifying, and caused disruption to our lives, I am grateful to have had the opportunity to fulfill my civic duty," Ford wrote, adding that she sends love and support to others who have shared their experiences of sexual assault with Ford and the world. Neighbor Kristen Podulka, who hasn't seen Ford since September, said, "my number-one hope is that she can move home." Palo Alto Mayor Liz Kniss said she hopes to welcome Ford home with a proclamation, when Ford is ready. "Everything she has done is brave and courageous that certainly is a brand-new path for women to follow," Kniss said.